This clever new camera has not been launched on a HAB flight yet, and is just in prototype phase (though available for pre order) but could mark a step change in interaction with HAB photos. The camera image, which gives a 360 view of it’s surrounds, is made by combining the images of 36 cameras distributed around a ball. BN hopes to fly ones of the prototypes this spring / summer. Small and light weight cameras are handy for HAB, whether you are using a small balloon size or just want to pack in as many cameras as possible. 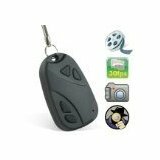 The 808 keychain camera is at the top of it’s class. The 808 weighs about 15 grams and it’s size is about 52 x32 x13 mm. The resolution of the camera is around 1mp. As many models of this camera exist (as well as imitations), go to the web site http://www.chucklohr.com/808/index.shtml for a more comprehansive technical review. I *think* i have version #16. It records about 45min of video before the battery dies. 45min video = just over 1gb. The video quality isn’t great and they have a tendency to go wrong. The main issue being them interfering with the GPS tracker. So extensive testing is needed for EMC before a flight. Mine seems to create no problems with the tracker. They are of course small, light and very cheap (£5-£10). so can be useful on a small balloon. While HAB video footage from the Go Pro Hero is good, it can always benefit from a bit of post processing. Last year, students from MIT in America collected HAB video footage using the Hero. They then using post processing to improve the quality of the video they captured. Michael Rubinstein picks up their story. “Near-space photography has been attempted quite a few times before (see some references below), therefore we figured it would be fun to try some more challenging conditions to photograph such as the sunset and the transition from day-time to night-time. In typical photography, lower lighting conditions are compensated by longer camera exposure, however this is impossible to do in HABs due do the rapid motion of the balloon. We can however record videos and apply some image and video manipulations in post-processing as we show below. The videos we captured are wide-angle 1080p (1920×1080 resolution) from two camera viewpoints – one facing downwards towards earth and one facing sideways towards the horizon. With the cameras we also sent up an HTC phone running Android, for which we wrote a small program to record accelerometer, magnetometer and GPS readings. We are glad to share our raw and processed data. Our raw videos are of higher quality than the videos shown that are further compressed by YouTube. If you would like to use our data contact Michael or Adrian. Noise reduction – the algorithm we used can run on a personal computer, but the implementation is proprietary and unfortunately I cannot share it (on our webpage there is a reference to the paper though). A HAB team lead by Colin Hardy showed of the great video footage you can get from I Phones with a recent launch from Welshpool airport in Powys. Colin and his team used three I Phones for a flight launching from the airfield on 17th March. Uploading the video has degraded some of the image quality and Colin said that the original footage is much better. For tracking, Colin used the I Phones in built tracking function and a Xenun style enhanced GPS locator. The Xenun tracker failed during flight, as did the I Phones. Thankfully the person who found the payload contacted Colin and it was recovered. There has been a recent flurry of action cameras hitting the market and now Go Pro’s latest model is out. What do the new features offer the HABist and those launching tethered flights. Weight : Go Pro has shaved 30% of the basic camera weight. Now the camera unit itself is 74g, down from just over 100g. The impact of this decreases as your balloon size increases but may open up more applications in the pico balloon field. 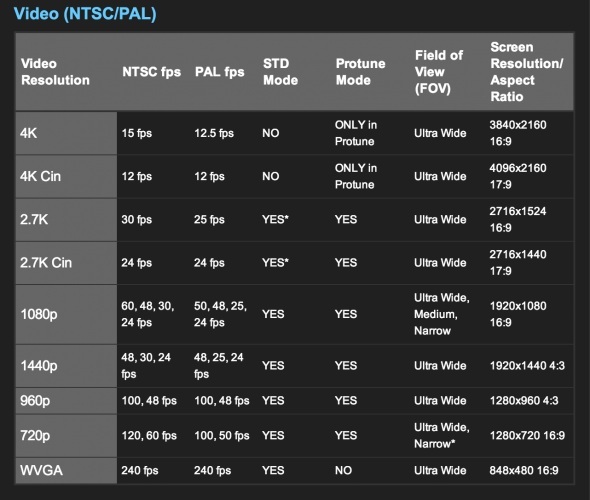 Video quality : Go Pro goes at length to describe the improved optics and video quality. To the amateur I am sure there will be some perceptible improvement but if the lens fogs up then not much of that will be perceptible Of more significance may be the ability to take stills and video at the same time negating the need for two cameras. For those that find the video quality important, here is a performance chart. Of more significance is what the camera didnt include there is no GPS function, no acceleration data and no speed data as with the Contour or Gobandit. I think Go Pro are missing a trick here. In conclusion, the standard camera is comparable in price and picture quality to it’s main competitors. The camera does, however lack the additional features such as GPS which add an interesting and useful dimension to photograph from balloons. I already have a Go Pro Hero 2 and won’t be changing it any time soon. With the entry of Gobandit into the market, there is now a nice choice of action cameras to pack into your payload. In the first part of the comparison I’ve looked at the main camera features. I’ve also included a range of experiences that sum up what people say about the cameras. In the second part I home to put all three on trial in a live test. It is important to note that the GPS functions on the Contour and the Gobandit cameras WILL NOT FUNCTION PAST 18,000 KM IN HEIGHT DUE TO COCOM RESTRICTION THE MANUFACTURERS PLACE ON THE GPS. If you are going beyond 18,000m then the gps function will cut out. 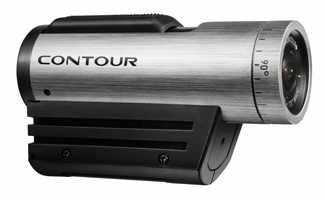 With the largest lens of any PoV camera, the Contour+ captures beautiful 1080p video. The 2.8″ aperture, 170° wide-angle rotating lens delivers the truest, high quality image with minimal distortion and fish-eye. It records and streams Full HD in all its glory – all from Contour’s unique, award-winning form-factor. My initial thought is that the video function looks the same as the Go Pro Hero however it lacks the ability to take digital stills. A deal breaker. A variant of the Contour does have a built in GPS function that georegisters your video second by second (http://contour.com/products/contour-gps) which is a really big deal maker. With a range of attachments the camera seems so more difficult to attach to payloads. In terms of the quoted battery life and possible memory expansion there seems nothing between it and the Go Pro Hero though this camera is bundled with an sd card whereas the Go Pro hero isn’t. What about price? At $200 it is cheaper than it’s rival but no UK retailers were listed so add International shipping and International VAT to that price before comparing it. Still, when it becomes available in the UK I will seriously consider giving this camera a balloon ride to see how it performs. “A few weeks ago we sent a bottle of our favorite beer, “Sternburg Export”, into the stratosphere on weather balloon. The helium weather balloon had a diameter of about 2.5m (8 ft) on the ground, and a diameter of 10m (33 ft) at its maximum altitude of 31,000m (100,000 ft), just before bursting. The box’s exterior was exposed to a low temperature of -49.8°C (-57.6°F). But inside the pressurized box, the temperature fell to only -15°C (5°F) – not cold enough to freeze the First German Beer in Space, Sternburg Export. The UK Bello Mondo project has also used the camera. This is what Michael from the project says. 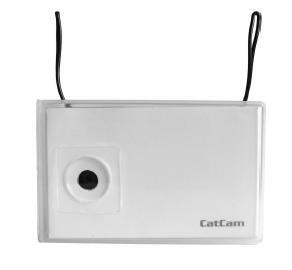 “The HD Contour camera is OK though it is not as good as the Go Pro Hero. As for the battery life, I hard wired another battery to the HD Contour as the standard battery wouldn’t last as long as I wanted. I also had to turn the quality of the video down a bit to fit all the footage on the SD card I used. I think I ended up with about 5 hours worth of footage in the end. I am currently experimenting with using NIR filters. I have asked for some technical details from Gopro technical support and here is what I have gleaned. The camera is fitted with a lens that has a NIR filter coating. When taking pictures using additional filters to add this effect, it will over power the initial filter. So you can still get a good NIR image using a filter like the Hoya R72. Today I collaborated on a launch by students from South Cheshire College. One team used the Hero 2 as the main camera. The camera was sealed in the case and the case placed in a polystyrene sphere with the lense exposed. The case covering the lens became iced during balloon assent resulting in poor images from the camera. A poor result considering that the rest of the equipment performed well. This is a small but really powerful video camera. I used it on mission 1 as the down pointing camera and it worked like a dream. It’s size (about credit card size and nearly 2cm thick) and light weight makes it an ideal secondary camera or camera you use in experiments. The quality of the images was great, it was easy to use, and the camera ran for a little over 2 hours. Perfect for most balloon flights. The cost was great as well. New, it was around 60 pounds sterling. It could be improved by having a longer battery life. My 8gb card still had 2 gb of unused space. If it can take a 16 gb then a battery life to fill that memory card with continuous video would be great. I strongly recommend this as a secondary or support camera.